380 pages | 20 Color Illus. | 148 B/W Illus. Planar Chromatography–Mass Spectrometry focuses on a relatively new approach to chemical analysis in general, and to separation science in particular. It is the first book to systemically cover the theoretical background, techniques, instrumentation, and practical applications of planar chromatography–mass spectrometry as a hyphenated tool of analytical chemistry. It also examines the high and as-yet unexploited potential of planar chromatography–mass spectrometry for analytical use in scientific investigations. This book overviews the combination of planar chromatography, a relatively simple and cost-effective separation step for determining complex mixtures of compounds, with mass spectrometry, an efficient, highly instrumental, and relatively expensive technique that enables rapid identification of separated chemical species. It covers electrophoretic–mass spectrometry methods and applications, which are considered planar chromatographic techniques and are increasingly being exploited in proteomic and molecular biology studies as well as for medical diagnostic purposes. It also provides a selection of applications, such as drug control and forensic and food analysis, including more difficult substances such as carbohydrates and lipids. 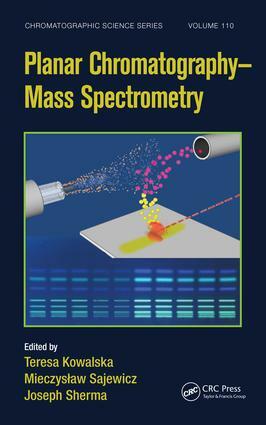 The book advocates growth in using planar chromatography–mass spectrometry in laboratories that have appropriate equipment but have not yet employed the techniques in combination. It also describes the use of a relatively inexpensive commercial system that can be adopted by laboratories currently working without the coupled methodology. Aiming to improve power and efficiency when other analytical methods are inadequate, Planar Chromatography–Mass Spectrometry encourages separation science practitioners in academia and industry to combine the two methods for enhanced results. Teresa Kowalska earned an MSc in chemistry from the former Pedagogical High School in Katowice, Poland, a PhD in physical chemistry from the University of Silesia, Katowice, and a DSc in physical chemistry from The Maria Curie-Sklodowska University in Lublin, Poland. She has authored and coauthored approximately 300 original research and review papers, 16 invited book chapters, and approximately 500 conference papers for scientific conferences. She is also coeditor-in-chief of the international chromatography journal Acta Chromatographica and an editorial board member for several chromatography journals. Her main research interests focus on applications of thin-layer, high-performance liquid and gas chromatography to physicochemical problems. Mieczyslaw Sajewicz earned an MSc and a PhD in chemistry from the University of Silesia, Katowice, Poland, and a DSc in pharmacy from Collegium Medicum, Jagiellonian University, Kraków, Poland. He has authored and coauthored over 150 original research papers, over 350 conference papers, an encyclopedia entry in Encyclopedia of Chromatography, Second Edition, and two book chapters. He is an editorial board member and coeditor-in-chief of Acta Chromatographica and an editorial board member for the analytical chemistry section of The Scientific World Journal. He is also a member of the Organizing Committee of the annual all-Polish Symposium on Chromatographic Methods of Investigating the Organic Compounds and co-chairman of the Scientific and Organizing Committee of the same event. Joseph Sherma is professor emeritus of chemistry at Lafayette College, Easton, Pennsylvania. He earned his PhD in analytical chemistry from Rutgers, the State University, New Brunswick, New Jersey, under the supervision of the renowned ion exchange chromatography expert William Rieman III. He taught courses in analytical chemistry for more than 40 years, was head of the Lafayette College Chemistry Department for 12 years, and continues to supervise research students. He has authored, coauthored, edited, or coedited more than 750 publications, including research papers and review articles; approximately 30 invited book chapters; and more than 65 books and U.S. government agency manuals in the areas of analytical chemistry and chromatography. He served for 23 years as editor for residues and trace elements of the Journal of AOAC International and is currently its acquisitions editor. He received the 1995 ACS Award for Research at an Undergraduate Institution sponsored by Research Corporation, and the first 2009 issue of the journal Acta Universitatis Cibiensis, Seria F, Chemia was dedicated in honor of his teaching, research, and publication accomplishments in analytical chemistry and chromatography.